While our state often gets a bad reputation for both its politics and business climate, a study released last year by the U.S. Bureau of Labor Statistics found that Illinois was one of the states with the greatest increase in the number of new business startups, second only to Massachusetts. While California has the most business start ups overall, their 3% growth was easily surpassed by Illinois’ 4.7% growth. On a local level, small businesses play a vital role in our economy, particularly as the state workforce continues to shrink and the number of small businesses increases. Since 2003, United Community Bank has partnered with Springfield Business Journal to recognize deserving small businesses in our local area. Each year, 15 businesses with 15 or fewer employees are selected for this award. They must be located in Sangamon or Morgan county and have been in business for at least two years. This year’s 15 Under Fifteen recipients represent a wide variety of industries and range from newer businesses such as a food truck and a company that makes custom furniture from reclaimed wood to several long-standing family businesses. We hope you enjoy reading their profiles inside this issue of the SBJ. UCB will host a reception at their Montvale branch to honor this year’s selectees, and Paul Palazzolo, Sangamon County Circuit Clerk, will be the keynote speaker for the awards ceremony that follows. We invite you to join us in recognizing this year’s selectees, who all help to make Springfield a great place to live and work. Thank you to our sponsor, United Community Bank, for their ongoing commitment to celebrating local businesses. Paul Palazzolo has been Circuit Clerk of Sangamon County since May 2015. Previously, he served as Sangamon County Auditor. In both offices, Paul has impacted the efficient and effective service for which Sangamon County government is known, including saving millions for the taxpayer in the County budget and enhancing Circuit Clerk operations. Paul is a life-long Springfield resident and has been active in community endeavors. Currently, he’s a member and past president of the Kiwanis Club of Springfield, and he also served as president of Kiwanis International, leading the efforts of some 600,000 club members around the world. 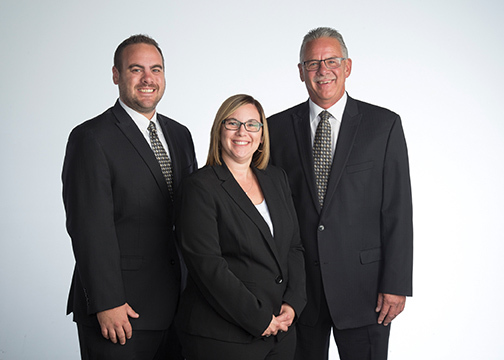 Paul and his wife, Suanne, a licensed funeral director at Staab Funeral Home, are the proud parents of two children. Reception 5:30 p.m. | Ceremony 6:15 p.m.
His grandfather, Chester, started the family-run business in Divernon in 1924, and today they have a location in Auburn. They provide funeral and cremation services. His children, Sarah and Tyler, are following in his footsteps, and the family prides itself on offering personal service. “People like to deal with people they know and trust,” he said, noting that his father instilled in him the adage that you treat people the way you like to be treated. “I want to carry on the Bramley name,” said Tyler, who grew up watching his grandfather and father touch so many lives. “It’s a great honor. 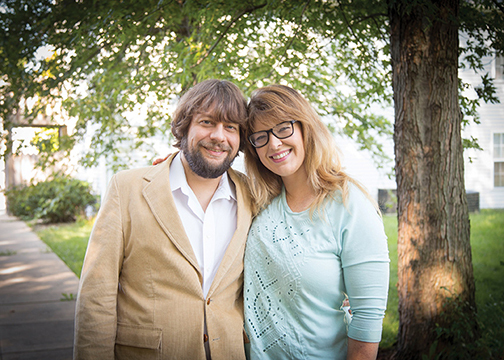 We’re there for people in their worst state.” Sarah added that they’re a pretty close knit family. “It’s nice to work with my dad,” she said. Tim’s proud to have his children helping him. “They do a fantastic job,” he said. L.A. Burton and Associates, Inc.
Larry Burton started his career in the banking industry. He received a degree in finance from Eastern Illinois University in 1970 and moved to Springfield in 1978 where he started at First National Bank. When the bank was sold in 1998, he decided to open his own business. His firm is a registered investment advisory firm, and he is registered with the SEC. His three advisors are registered fee only advisors. He provides investment management, advisory and consultancy services to individuals, institutions and corporations, and currently works with about 40 clients, managing 120 investment accounts. He believes what sets his firm apart is the personal attention he provides to his clients, and everything he does is in their best interests. “I have a close, solid relationship with my clients,” he said, adding many have been with him for more than 10 years. They appreciate that he’s a cautious, experienced investor who has weathered a lot of recessions, booms and busts. Currently, he said, the business is pretty static and there’s not a lot of opportunity for growth. He’s been in the business a long time and hasn’t seen anything like this before. The market is making it difficult to invest safely and people need to be cautious. If you’re looking for traditional American dishes served with a twist, look no further than Cooper StrEATside Bistro. Justin and Kendra Cooper serve up burgers, pork and rice bowls, tacos, salads and bistro chicken sandwiches and are known for their hand-cut fries that can be tossed with fresh minced garlic upon request. They use only fresh, seasonal local ingredients and can accommodate and vegans and the gluten-intolerant. Based out of Williamsville, you can find the custom-fabricated StrEATside truck at the Springfield farmer’s market, state agencies and private events. They can cater any event and will work with clients to design a customized menu plan. Justin received his culinary degree from the Art Institute of Phoenix. “I have a passion for food,” he said. Having grown up on a farm, he remembers helping his mother and grandmother in the kitchen. It wasn’t until Kendra met Justin that she became a foodie. She created the pork and rice bowls, which is one of their most popular dishes. “We have a lot of fun together,” she said. They tried their hand at a few different ventures after moving back to the Springfield area from Phoenix but nothing clicked. At that time, they would take Justin’s father to lunch every day. “We called it the lunch bus,” said Kendra. They tired of taking him to different places and eating the same food and decided to open a food truck. They would like to open a brick and mortar restaurant in the future and add a second truck. “We couldn’t do this without our employees, family and friends,” said Kendra. A certified kitchen and bath designer, Curt Trampe purchased a DreamMaker franchise in 2006 and rolled his previously existing business into it. “We did baths and kitchens before, among other things, and just shifted our business model to only focus on baths and kitchens,” he said. He graduated with a degree in exercise physiology from Wheaton College but ended up working for local family members who owned an exterior remodeling company. “I put the pieces together,” he said, and discovered he enjoyed seeing how projects came together and started his own business. He empowers his employees to make decisions that follow the mission of the business. Each quarter, he opens his books and goes over the financials with his employees so they know how the business is doing. He works with clients who aren’t sure where to start and helps them design a space that they can enjoy. He starts by asking questions and gathering information and photos that he can use to create a design plan. Once the clients approve the project, he helps them pick out materials so everything is taken care of up front before the project starts. “It makes things a lot less stressful,” he said. He relocated from the industrial park area two years ago and has seen an increase in business. “It worked out well,” he said. Curt has seen steady growth and plans to continue that trend. “Chrissy’s family has owned the apartment building since they built it,” says Chris Becker. “About seven years ago, we were asked to come back to Illinois and manage it.” Chris had been involved in apartment management before while working as a mechanic in the Navy, making it a good fit. “We have been doing everything ever since,” he says. The property has 64 units and some current tenants have been residing there since it first opened 30 years ago. There are a mix of one and two bedroom units, and all the units include full size washers and dryers, which Chris said is a popular feature. The property is located just off Jefferson Avenue, but tucked in a wooded area surrounded by four acres of land, which makes for a peaceful setting. “It’s a very nice place to live,” Chris continues. “We have many tenants who work in offices downtown or at the medical institutions; it’s an excellent location because it’s close and convenient but without all the traffic and noise.” He said the tenants are thoroughly screened, which helps insure a quiet living environment for everyone in the apartment complex. “My mom started the studio when I was a little girl,” said Gretchen Burghart, who moved back to this area after dancing professionally in New York. She joined her mother, Jan, in 2010. Jan had been a professional dancer in a performance company in the 1960s but gave it up when she married and had children. Her passion for dance was reignited after she took classes with Dorothy Irvine. When Gretchen was three, her mom started a neighborhood dance studio in the basement of their home. They teach classes for ages 18 months through high school and recently added adult courses. Today, more than 200 students are enrolled and they offer 48 classes a week including ballet, tap, jazz, hip hop and lyrical. Gretchen said 80 percent of the students take more than two classes a week. “Several have gone on to become professional dancers,” said Gretchen. Former students dance on cruise ships, with dance companies in Chicago and at Disney World. Several have even followed in her mom’s footsteps and become dance teachers. 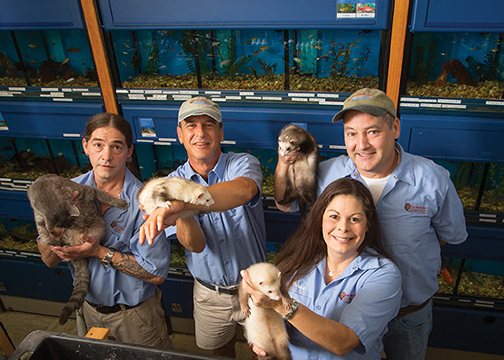 Since opening their pet store three years ago, Chris and Rachel Laier said their family-owned business continues to grow. They carry a line of super-premium pet foods from whole meat sources as well as everything one might need to care for their pet. Everything they sell is all-natural and American-made. The pair have always loved animals, have an extensive background in animal care and have offered pet food home delivery services for more than 10 years. “We have a loyal customer base, which is why we have the store,” said Rachel, adding they also offer a line of human products, including greeting cards and scented candles. They work with their customers to ensure they only get the equipment that they need and that they understand what they are purchasing, asking questions to make sure the products are the right ones. All their livestock is healthy and their aquariums are the cleanest in town. They carry a large selection of fresh and saltwater fish, and will help with aquarium set-up and maintenance. People travel from all over central Illinois because of the selection. 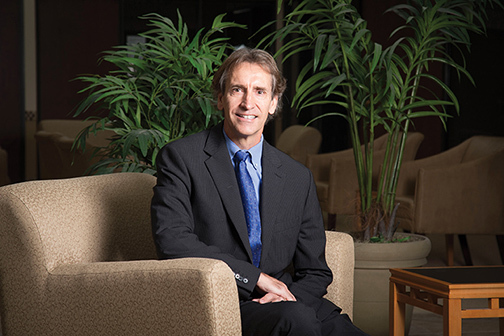 When he graduated from dental school in 1987, he joined the practice of the late Dr. Larry Richards. He was in the process of starting his own practice when Dr. Richards died, so he took over the practice and moved to his current location. He provides general and comprehensive dental services and works with local physicians to design custom-made sleep appliances for patients with sleep apnea. He recently became board-certified and designs appliances that can be used alone or in conjunction with CPAP. He said he’s fortunate and blessed to have the group of employees that he has. “You can only be as good as your team,” he said. 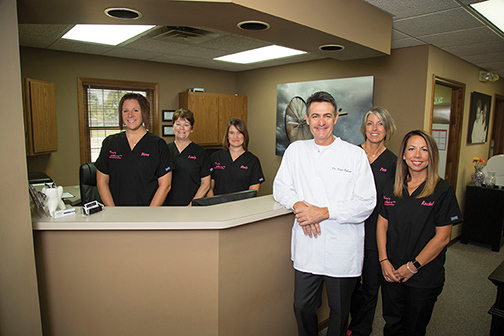 His patients enjoy the friendly, family atmosphere and often stop by to visit. For these three, physical therapy is not just a job, it’s their passion. “Leah and I left St. John’s to come here,” said Brigitte Cutler. They wanted to work for themselves and to treat patients how they wanted. Combined, the three of them have more than 60 years of experience in the field. They call themselves movement specialists. “No one understands movement better than physical therapists,” said Kirsten Transue, who joined the practice in 2012. 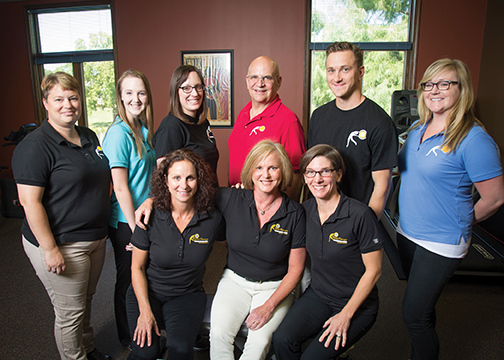 They are the only locally- and independently-owned physical therapy practice in Springfield and offer both outpatient physical therapy services and a wellness program. They work with everyone from young children to adults in their 90s. “A lot of physicians refer their patients to us,” said Cutler. They work with both operative and non-operative cases. “We specialize in manual therapy,” added Transue, a field in which all three have received advanced training. Patients love the friendly, supportive atmosphere and the time the therapists spend with them. “They’re not just a number,” said Cutler. Many patients have become close friends. They are currently looking for a bigger space. Future plans include adding a personal trainer. Dr. Tanya Desanto opened Prairie Dental Group in 1994 and loves creating smiles and transforming people’s lives. 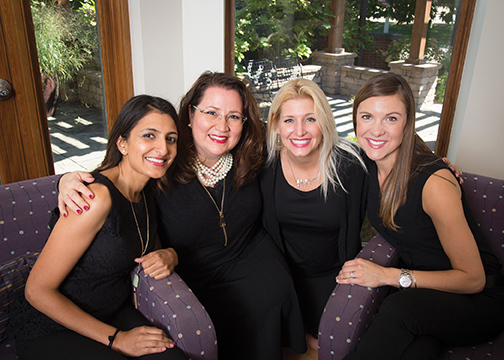 She has three associates, and her dental practice is the only all-female practice in Illinois. Her state-of-the-art office offers general and cosmetic dentistry. “Our patients trust us,” she said. “They know they’ll be comfortable and have a great outcome,” and points to their Smile Gallery as proof. Her staff truly cares about the person, and her patients refer others to them. They even have several international patients. “Our reputation gets out there,” she said. She and her associates are members of the American Academy of Cosmetic Dentistry, and people come to them because of their credentials. She believes in giving back to the community. She supports domestic violence programs and participates in dental clinics. She related a story about a woman from Litchfield who was a finalist in a national smile contest a few years ago. The show contacted her and asked if she would do the woman’s makeover. “I’m living the dream,” she said. Brian Frieze turns reclaimed wood, salvaged from structures built in the 1800s, into functional works of art. He specializes in creating kitchen tables, fireplace mantles and sliding barn doors and works with commercial and residential clients. His dad owned a construction company, and he grew up in a family of carpenters. When the old barn on the property next to his family’s farm was slated to be bulldozed, he asked if he could dismantle the building and keep the wood. He and his wife, Breanne, started the business from scratch. “I saw a market for it in central Illinois,” he said. He began making reclaimed wood furniture and opened a showroom. Customers receive a postcard with a photo of the building the wood came from and a history of the property with their custom-designed piece. “I really enjoy seeing something I’ve made,” he said. He provides customers with a unique piece of furniture that they can’t get anywhere else. He employs veterans and is proud of the Flags for Heroes wall art that his business makes. All proceeds go to veterans and first responder organizations. A former veteran himself, he served in the Air National Guard and currently works full-time as a firefighter. “It’s my first passion,” he said. Recently, he expanded his wood shop and showroom and plans on having a grand reopening the first part of next year. 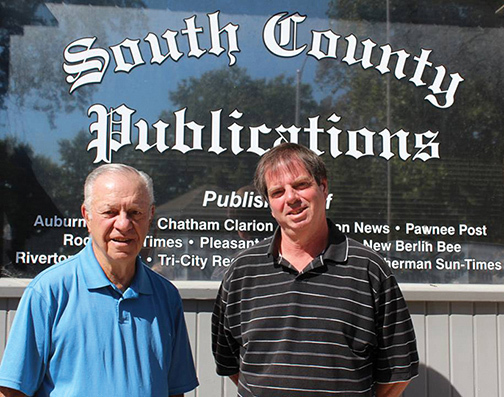 Joe Michelich, 86, runs South County Publications, a family-owned business based in Auburn. “I own every weekly newspaper in Sangamon County but Illiopolis,” said Michelich. In 1963, he bought the Chatham Clarion. “I was 29 years old,” said Michelich. He added the Pawnee Post, Rochester Times, Pleasant Plains Press, New Berlin Bee, Riverton Register, Tri-City Register and Williamsville-Sherman Sun-Times over the next few years. Michelich said the newspapers are doing okay. “We’ve been here 100-some years and we’re not going anywhere,” he said. “It’s an important part of the town.” He employs 12 regular full and part-time people plus a few part-time employees who fill in by covering meetings or help with paper production. Barry Taft believes in building long-term relationships with his clients and has been helping them solve their real estate problems since opening Taft Appraisals, Inc. in 1989. “I wanted the flexibility that having your own business provides,” he said. He received his MBA from the University of Illinois and has a background in small business. He specializes in commercial real estate appraisals and property tax consulting, working with clients in the central Illinois area. He has been at his current location for almost 25 years. What sets his business apart is his staff and the contacts that he’s developed over the years. “This allows us to provide expertise in a wide range of property types,” he said. He said business is good, and he plans to continue growing. “We’re always striving to do more and better,” he said. 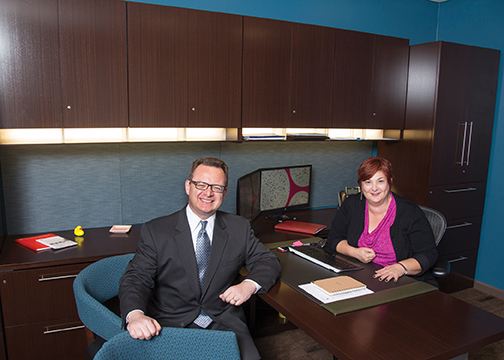 Wiley Office Furniture has been in the Hoffman family for three generations. The company offers a full line of high quality products at competitive prices. “Zach and I purchased into the company,” said Diane Beauchamp, who has been with the company 30 years. She started as a designer and worked her way into sales and management. After moving back to the local area, Zach rejoined the family business and has been with the company 14 years. “We’re a well-balanced team,” said Beauchamp. Each brings complimentary skills to the company and has great respect for the other. “Between experience and integrity, we have the complete package,” said Beauchamp. They offer a full spectrum of services from interior design to sales to support and have worked with some clients for more than 50 years. “The reputation we have is priceless,” she said. Today, it’s about more than desks and chairs. “It’s about the work environment,” said Hoffman. Clients want a multi-purpose work space that can support new processes. They work with clients to design and install functional work environments that help solve a client’s problems and are aesthetically pleasing. 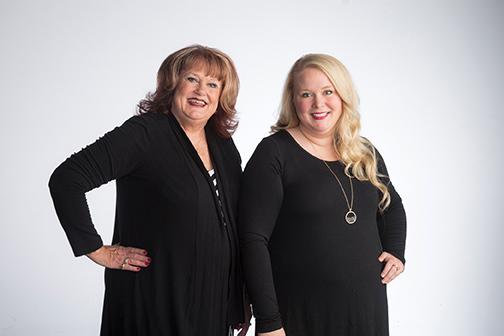 Beauchamp said when clients do business with them, they get her undivided attention and personal touch. “That’s true of all our employees,” she said, adding they have a great team. Business is doing well, and they plan on continuing to move forward and delivering the same solid level of performance.